8th Annual Celebrity Waiter Breakfast! United Way of Northwest CT's Annual Campaign Kickoff! Look who it is! Well guess what, they're your waiter! Come Celebrate our Campaign Kickoff on September 6th, 2018 at our Celebrity Waiter Breakfast at the Torrington Country Club! Your waiter just might be your favorite Dinsey character! Chose to be a Waiter, or an Adoring fan! Waiters/Waitress' need to dress up as a Disney character. Character Selection is on a first come first serve basis. No duplicates will be allowed. 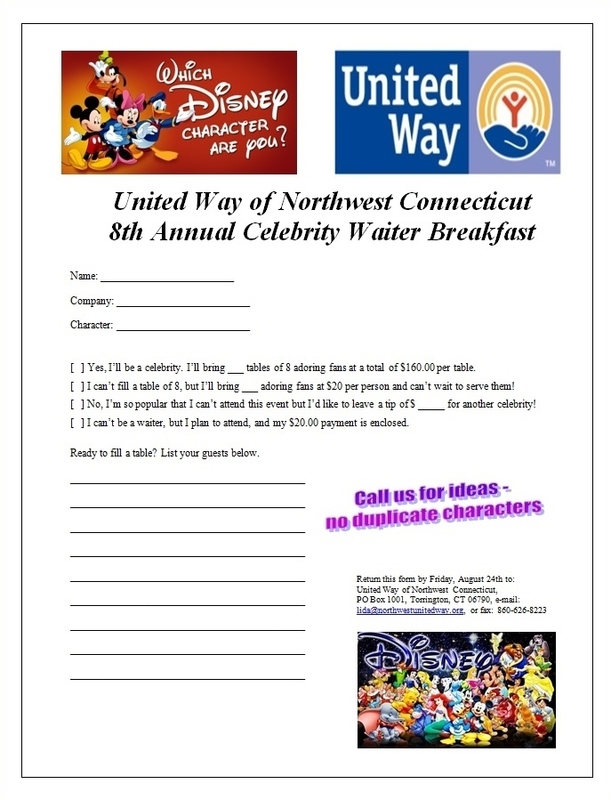 Contact Lida at the United Way office at (860) 489-4131 or lida@northwestunitedway.org for character availability. Each waiter/waitress' is also in charge of filling, and serving a table during our breakfast. Each adoring fan is $20, a table of 8 is $160. Please help us and let your friends, colleagues and followers know about our page: 8th Annual Celebrity Waiter Breakfast!